Embroidered floral corners and broderie lace with floral embroidered centre detail cotton Oxford edge pillowcases. Embroidered floral corners and broderie lace with floral embroidered centre detail cotton Oxford edge pillowcases. 100% cotton percale pillowcases with a decorative scalloped Oxford edge. Embroidered personalisation, with monogrammed initials, Mr and Mrs or His and Hers. A stylish original gift for couples, for a wedding or anniversary gift. The personalisation is embroidered in your choice of coordinating thread. You can have a name, word, or initials monogrammed on each. 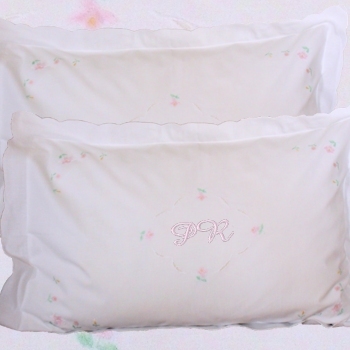 These quality embroidered pillow cases are machine washable and ironable which provides a far better lasting finish than with the printed versions available elsewhere. The pillowcase measures 50x75cm oxford style 2 inch scalloped border. A unique yet useful gift! Please allow approx 24-48 hours for dispatch as these are made to order.